How can you reduce, reuse and recycle? Reduce the amount of consumables and resources that you use. This results in less pollution, less energy usage and less waste, and minimises the impact of manufactured materials on the environment. For example, you could reduce the amount of travelling you do by car or opt for fresh foods instead of prepackaged foods. Reuse as many items as you can, as this keeps them out of the waste stream and reduces the amount of waste that needs to be processed. Reusing manufactured materials and containers is a discipline that was second nature to our parents and grandparents, and is one that we all need to develop again. Making use of reusable shopping bags instead of buying disposable bags every time you shop is one way of reusing. Another way is to repair appliances and upgrade computers instead of replacing them. Send as much of the waste generated in your home or office for recycling as possible. Recycling is the process of converting used items back into a reusable material and then using this to make new products. Recycling conserves natural resources and reduces the need to put waste into landfills. You can recycle paper, glass and cans, as well as certain kinds of plastic and metal. Specialist recycling facilities deal with items such as computers, ink cartridges and compact fluorescent bulbs. It’s important to remember that recycling isn’t the same as downcycling. The process of recycling involves reusing a material to produce another product that is the same as the original product. Downcycling involves reusing a material to create a different product that can’t be recycled again. An example of this would be the downcycling of plastic bottle tops to make umbrellas. In the case of downcycling, the material can only be reused once and then stays in the environment indefinitely. It can be recycled into things that are useful or things that enrich our lives. Cape Town artist, Keri Muller, calls her imaginative creations “stuff,” but we should all find inspiration in how she finds beauty and meaning in things that other people would throw away. To learn more about Keri's work, please click link above. Many people think recycling is a hassle, or they don’t do it because they feel no-one else is doing it. In fact, it’s quick and easy to set up a recycling system in your home or office and if we don’t all take the lead on this, we’re going to end up drowning in trash. In developed countries, one to three kilograms of garbage is produced by every person every day, either directly or indirectly! Set aside some time to sign up for a recycling service and to get a recycling bin and a composting bin — the rest is easy. Paper needs to be kept separated so that it can remain clean and dry. All other recyclables can be put into a single garbage bag and placed into your recycling bin for collection. Make sure you give the items you’re putting out for recycling a quick rinse before you do as it’s not always possible to recycle dirty or contaminated materials. In addition you can compost all kitchen waste except cooked food and meat — your garden will thank you for it. There you have it! Recycling really is very simple once you get into the swing of it and it makes a huge difference, not just right now, but for all the generations still to come. 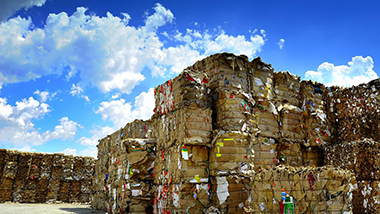 Sappi paper is not only reusable and recyclable, it is also biodegradable and doesn't leave toxic residues in the soil or water.